Chandler, AZ Ukulele Lessons Near Me | Fun Classes. Top Teachers. Check out some of our most popular teachers near Chandler, AZ including Phoenix, Tempe, Scottsdale, Gilbert and Mesa. excited to announce I am available for on-line lessons, and will now be able to work with students from all over the world, regardless of distance or location! Build a foundation of techniques to be able to play riffs, scales, chords and songs as quickly as possible. Build strength and dexterity through different patterns and have an overall understanding of how the instrument works and how to be creative with it. Have you always wanted to learn how to play the Ukulele? Let me help you learn how to play your favorite songs! 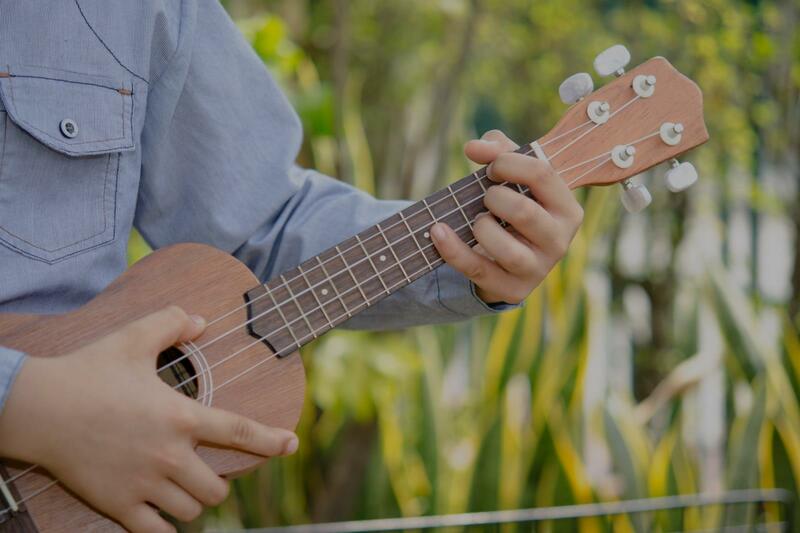 During our lessons not only will be learn how to play the Ukulele we will also go over: Chords, music theory, strumming patterns, ear training and more! My name is Chris and I am a professional guitar player. I have been teaching sense 2008 now and sharing the joy of music with others has become a passion of mine. I started playing the piano at the age of five, the trumpet at nine and the guitar at thirteen. Over the years I have also learned to play the drums, bass, harmonica as well as how to sing. I studied at L.A. Music Academy as well as Musicians Institute. I am currently in two bands and putting together a third. I do session work for other artists and have played the National Anthem for a profession football team. curriculum just for them based on their musical desires, strengths and weaknesses so I can help them become the best player that they can be. Each lessons will be a balance of learning new technique and theory and applying them in songs that excite and inspire. Things such as: music theory, ear and harmony training, single string technique, sight and cord chart reading, cord structure, song writing, tone shaping, guitar maintenance and playing live will be covered with students as they advance. Feed back is always welcome and appreciated. This is your lesson, let's make sure you get the most out of it. My son had a great first lesson! He is already looking forward to his next! My daughter just had her first lesson and she enjoyed it so much! displays a wide range of musical knowledge and interests. His positive support for this first lesson gave us confidence, challenged us, and we can’t wait for lesson number 2. My doctorate is in music and I have experience teaching music at multiple universities, as a public schools teacher, and as a private instructor. I customize lessons to individual needs and desires. Let's start your musical journey! I look forward to hearing from you! I couldn't be happier with my lessons. Carl is providing me with sound advice and is very friendly. Thank you! Learn fundamental technique in a variety of different styles with an emphasis on the underlying theories that make up the musical world. I have been studying music for over 2 decades, I graduated with a Bachelor's in vocal performance from the prestigious Musicians Institute in Hollywood, CA. Over a decade of recording and live performance experience in a various disciplines including pop, rock, reggae, folk, indie/alternative, opera, musical theatre, and jazz. I am a proficient group and private music instructor teaching voice, piano, ukulele, electric bass, flute, cello, music theory and composition. I have experience working with children in a therapy music program, and students with special needs. f my students, and creating lesson plans that are designed to meet the specific needs and desires of each individual student. My teaching style ensures that my students not only learn the musicality of the instrument, but have fun while playing. My personal performance specialties are singing and playing in blues, rock, reggae, folk, and indie/alternative. I have recording and live performance experience in various disciplines and I am also proficient in opera, musical theatre, jazz, and pop. I am an experienced group and private music instructor teaching voice, guitar, piano, ukulele, electric bass, flute, cello, music theory and composition. Very patient worked well with my Son on his first experience with cello. Nicest guy ever. Made me feel very comfortable. Looking forward to more lessons. I've been playing Ukulele for 5 years now and love it! It's a great instrument and perfect for beginners starting out on string instruments. Whether you simply want to learn songs or the techniques behind them, I'm here to help you reach your musical goals! Brandon is a great teacher! Brandon is a fantastic instructor! We are so happy with him! As a musician for 20 years I have had the privilege of learning various instruments besides my primary instrument of guitar. Several years ago I started ukulele, through my years of professional experience in learning music theory, guitar, and bass I have been able to apply my string knowledge to the ukulele which I am now offering to my students! I’ve got an energetic and encouraging personality. I have been teaching ukulele for several years and have instructed many students to become competent ukulele players. If you want to learn music from a movie or some classics, I will not only develop your competence in your instrument, but enable you to play everything you want. Pick up your ukulele and start your lessons today. to study, you’ve come to the right place. I have flexible availability and can advise in the purchase of new or upgraded equipment. I invite you to try a lesson with me, there’s no obligation to commit to any more than you’re ready for. Whether you’re 5 or 75, I have the prowess and comprehension to help you achieve your music goals, whatever they may be. Terry helped me to improve tremendously at guitar. He even showed me great ways to play a couple songs that weren't intended for acoustic. I love what I'm playing and under Terry's tutelage, I keep getting better. I tried three other teachers before I found Terry and I couldn't be happier, he really understands guitar. I am a music teacher at North Little Rock School District. Beginner courses will include: music fundamentals, Ukulele strumming patterns, learning at least 5 chords, pentatonic scale, and major scale. You will be able to pluck or strum folk, classical, and pop songs as courses progress. Ukuleles are provided during lesson or you can purchase your own so that you can practice at home. I have been teaching music for a few years now! I enjoy music so much! I received my degree from the University of Arkansas Little Rock. I am also a member of the worship band at my church. One thing that I enjoy the most, as a teacher, is seeing growth and seeing students get that “aha” moment. The most amazing thing about teaching is being able to see the joy in students as they perform. They get to be themselves. Playing an instrument or singing is raw, vulnerable and takes a lot of hard work. Being a musician is worth it. You get to be able to express yourself in ways impossible otherwise. Please let me help you along your journey to become the musician you dream to be. Josh has been playing and performing music for over 13 years. He has achieved a bachelor's degree in instrumental music education and has experience as an instructor teaching private students and group classes for over 7 years. He has studied instrumental music education including areas of classical music, jazz, theory, history, and improvisation. Experienced with students of all ages, backgrounds, and styles. During the lessons, topics that are covered include learning reading techniques incorporating standard notation and tablature, and playing styles such as using a pick, finger-style, using finger picks, slap, tapping, and various pizzicato techniques. s are always welcome to attend and sit in on the lessons. Can't find a teacher in Chandler, AZ? "He's very nice and a great teacher. I'm learning a lot." Phoenix, AZ teacher: Joshua S.
xplanations for things. So he’s a perfect instructor for a beginner like me. I feel really lucky to have found him. I highly recommend Philip." Phoenix, AZ teacher: Phillip Z.
ho truly loves music and shines through in teaching style. His love for music is an inspiration for me. Phil is an experienced professional, reliable, enthusiastic and his lessons are always meaningful and productive. If you're wanting to learn how to play the guitar or uke, Phil is the guy. Never to late to learn how to play an instrument. He is the best. ;-)"
"Brandon is a fantastic instructor! We are so happy with him!" Phoenix, AZ teacher: Brandon B.
tice everyday and look forward our my future sessions!" "Brandon is a great teacher!" "GREAT UKE teacher. Patient, Encouraging, very knowledgeable, makes good comments about how to improve my playing. Makes complex music theory simple . and study more. Pure MAGIC." Whether you're celebrating National Talk Like a Pirate Day or sailing the high seas, playing a pirate tune on the ukulele is a fantastic way to pass the time. Try one of these tunes from ukulele teacher Willy M.; they're rated arrrr for pirates! Who doesnt want to play the ukulele? Its the perfect instrument for sitting on the beach in summer. But while youre sitting on the beach, relaxing, watching the boats sail by, seeing the crabs scuttling along the sand, what naturally comes to mind? How Often Should I Practice Playing Ukelele? Guide to Ukulele Sizes: Which Size is Right for You?